West Virginia lies in the north-eastern part of the country and is a perfect location for ranch holidays and farm vacations. 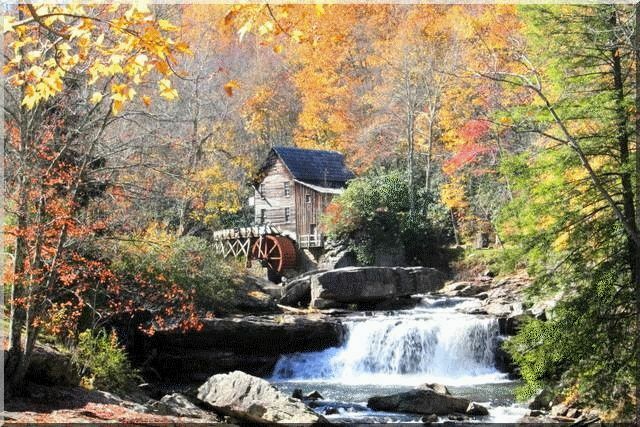 The state is noted for its great natural beauty and is also known for a wide range of outdoor recreational opportunities, including skiing in the winter, whitewater rafting on New River Gorge and Gauley Rivers, rock climbing, caving, horse riding, fishing, hiking, mountain biking, camping and hunting. This is a state that is known for its wild beauty and mountains, hills, forests, rivers and waterfalls abound. Blackwater Falls is one of the most beautiful waterfalls you will find anywhere. Both Blackwater River and Blackwater Falls get their names from the dark bronze-coloured water that is a result of tannic acid leaching out of fallen spruce and hemlock trees. At the falls the river plunges and cascades about 50 feet before twisting and winding its way for eight miles through a picturesque canyon. Cathedral State Park, in the north-eastern corner of West Virginia, is another spot to visit while on your farm vacations. It contains one of the last remaining tracts of virgin timber in the State. Trees rise up to 90 feet in height and 21 feet in circumference, providing the perfect place for a picnic or hiking the well-trodden tracks. If you are tired of those farm animals take a break and have a look at some American wildlife at the West Virginia State Wildlife Center for a great day out. Here visitors can see many mammals, birds, and reptiles that are native to the Mountain State. For those of you who enjoy a little bit of history the Fort Mulligan Civil War Site is a reminder that West Virginia saw much action during the War Between the States. West Virginia is also home to Pocahantas County that has become a sought-out vacation destination for families and singles alike looking for active vacations. Over one million tourists visit this area annually, so they can't all be wrong. In fact, it has been described as the most beautiful area of all West Virginia and has the most scenic byways of any county in the State! There is far more to this State than what we have been able to describe here. To fully explore beautiful West Virginia, book your farm accommodation for your next ranch vacation. For those of you who are lucky enough to live in this State, see what rural services are available near you.